Mail bombs highlight unsafe working conditions for postal workers | Fight Back! New York, NY - Widespread panic erupted last month as more than a dozen package bombs were sent to public figures critical of the Trump administration. These package bombs contained identical one by six-inch pieces of PVC pipe packed with shrapnel, pyrotechnic powder, a timer and a detonator. 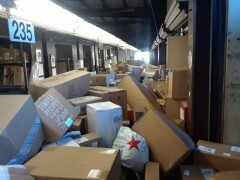 Thankfully, none of these packages exploded before being intercepted. One dynamic is often left out of the public discussion however: ultimately, it is not the high-profile celebrity and politician targets who face the most significant risk, but the postal workers who keep our society running. Given the amount of time package bombs spend in transit, the most likely casualties of this style of violence are working-class people whose names and faces will never grace the screens of CNN or other major pundit networks. The dangers that come with being a postal worker are far more significant than many people realize. In March 2018, for example, a mail bomb containing nails, metal scraps, and other pieces of shrapnel exploded while on the automatic conveyor belt at a FedEx facility in Schertz, Texas. The bombmaker, Mark Conditt, was later found to have posted anti-queer and pro-death penalty statuses on his social media and blogs. In May of that year, eight Teamsters were injured in an explosion at a UPS facility in Kentucky when hazardous acetylene gas leaked out of a trailer. Hazardous conditions for workers who move packages or letters is by no means limited to right-wing attacks. Oftentimes companies like UPS will not follow the proper safety precautions to deal with leaking, potentially hazardous packages. When a worker encounters a leaking package on the conveyor belt, they immediately will need to shut the belt off. This will lead to supervisors harassing the employees to get the belt moving as soon as possible. Instead of treating a leaking package as a hazard, supervisors treat it as an inconvenience that cuts into production. All in all, these lax safety standards, difficult working conditions, and right-wing threats make being a postal or package transport worker a dangerous job. When taken together, truck and delivery drivers have higher fatality rates than cops. At the end of the day, if those mail bombs had detonated, it most likely would have been workers who lost their lives.